My visit to Taylor Fladgate in Port on Monday was followed by a visit to Quinta da Bomfim near Pinhao in the middle of the Douro region. Recently expanded by the purchase of neighboring vineyards which are now being reorganized, Quinta da Bomfim is the heart of Dow’s Port. 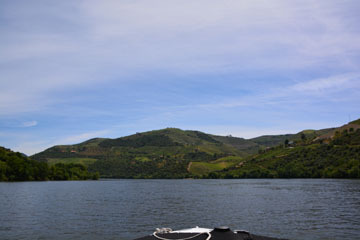 We stayed overnight in the old family house in the middle of the property and next morning took a trip up the river with Rupert Symington in his boat to the Quinta de Roriz. This is the center of Prats & Symington, founded by Rupert together with Bruno Prats on a shoestring to produce table wines in the Douro. 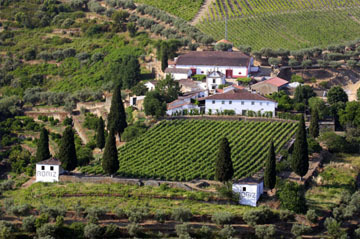 Starting by purchasing grapes, it proved so successful that they bought their own vineyards, most notably Quinta de Roriz in 2009. The dilapidated buildings are being restored and extended and all the wines are now made here in what will become a modern winery. 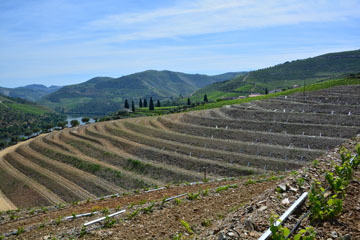 A team was furiously working at reshaping the land and planting new vineyards when we visited. Prazo de Roriz is a third wine based on the varieties that don’t make the cut for Post Scriptum and Chryseia, which are usually virtually exclusively Touriga Nacional and Touriga Franca, with around half of each. Touriga Nacional gives structure and breed, softened by Touriga Franca (“Touriga Franca is our Merlot,” Rupert says). The objective with these wines is to get purity of expression. “It’s easy in the Douro to think that new oak will flatter your wine, but I think Douro wine is all about purity of fruit,” Rupert says. “There’s no Portiness. It would be easy to get lots of extraction and alcohol, but that’s not what we want.” Indeed, the wines are notable for their moderate alcohol (usually around 13.5% compared with typical levels for the region over 14%). Dark inky color. More sense of fat and pluminess on nose than Post Scriptum. Lovely balance with elegant, well delineated black fruits giving a good sense of precision on palate, yet that sense of fat is poking through. The character is explained by the vintage, which was a difficult year that gave a much higher proportion of Touriga Nacional than usual. There’s a tang at the end a bit reminiscent of Côte Rôtie, although aromatics are more blackberry fruits and not as lifted as Syrah. This entry was posted in Wine and tagged Chryseia, Douro, Port, Post Scriptum, Quinta da Bomfim, Quinta da Roriz, Symingtons by Benjamin Lewin. Bookmark the permalink.